Clarence Harrison of Quindia Studios and author of the ECW rules, "Victory Without Quarter", has nominated me for the "Stylish Blogger Award". Thank you, Clarence . . . at least I think so. For, as Clarence wrote on his blog, "this award may be somewhat dubious since it comes with a 'chain letter' style rules requiring the winner to 'pass it on'." 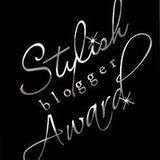 Thank the nominating blog and provide a link back -- done! I cannot sing . . . but I've been paid to perform in several operas (many operas have non-singing speaking roles -- my best role was Frosch in "Die Fledermaus"). I cannot play a musical instrument . . . but I've been paid to perform with symphony orchestras (Narrator in "Peter and the Wolf"). My wife and I met on the Internet (in a spiritual chat site) some 15 years ago. When I was with a theatre group in Colorado, I participated in the 5th International Muzzle-loading Biathlon . . . and finished second over-all for shooting (only -- I'm slow on skis). I've been reading Science Fiction/Fantasy for over 50 years and still have every SF book I've ever purchased (yes -- thousands of them). Ross Macfarlane's "Battle Game of the Month" -- which could win simply for its great masthead photo, but which always has interesting, thought-provoking posts as well as great accounts of games in a wide array of periods. "Steve's Random Musings on Wargaming and other stuff" -- not only has some wonderful game accounts and photos, but very frequently has interesting historical background material on units and personalities. Furthermore, he has collected and posted most of the early Grant "Table Top Teasers". "Campaigns of General William Augustus Pettygree" -- The wonderful "photo stories" which Bill Protz creates are truly inspiring. I strongly suggest that you visit the above blogs -- and do not limit yourself to their current posts, but sample many of their previous posts. Bill's blog should certainly benefit from starting from its very first post and reading forward. Just thought I'd second your nomination, no need to do it again!